Data's relationship with his cat "Spot" touched our hearts. 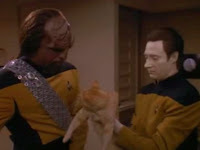 But, in real life, Data hated his cat. On the show Star Trek: the Next Generation the android Data was played by Brent Spiner. At a Q&A at Wizard World Philadelphia in 2010 he had some choice words about his feline acting partner who played Data's pet cat. What do you think of the video? Do you think cats are hard to work with? You think cats are bad? Try kids!! I am not a cat person. I'm allergic to their pet dander. So I would think they are incredibly difficult to work with. And as an aside, I think that the cat in Alien was not worth going after. I would have blown it up with the ship. Cats are too smart to do dumb tricks. "You want me to do what? Hell no!" I believe Spiner when he said the only time the cat did the scene right was with tuna. Makes them lose their furry minds. It's no secret that he hated working with the cats. Hopefully Scott Bakula liked working with dogs! Alex, I'd hate to be a cat trainer. Every sentence would end with.."and you'll get your can of tuna." S.L. Spiner is just funny period. Tony, it would be funny if a video showed up with Bakula complaining about the beagle in Enterprise. He could talk about the rain and be funny. I like him. Cats are very independent creatures for sure. This post was cool because my roommate named her cat after Spot. Though real life Spot listens pretty good. He even sits on command . . . sort of. Very independent Jessica. Is he the only cat in the world that sits on command? I've seen a cat trainer in action & worked with her: so firstly, they do exist - and secondly, yes, every sentence does indeed end with "and you'll get your can of tuna." The man got no cat communication! But cats can be angry... Though, fluffy and sweet!